Sport Magazine gave away Corvettes to MVPs- Sorry Pete Rose! For years Sport Magazine would choose an MVP for each of the major sports championships and award them with a brand new Corvette. Sandy Koufax, Johnny Unitas and Frank Robinson were among the sports icons who walked away with a snazzy Corvette for their athletic accomplishments. At a time when many athletes worked in the off season to make ends meet winning a $5,000 Corvette was a significant prize. 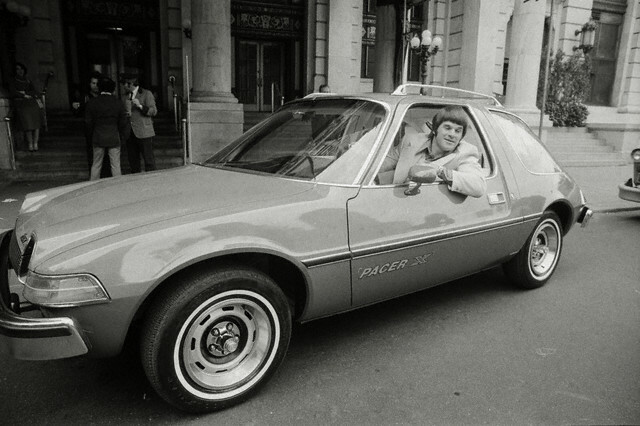 Strangely, in 1975 Pete Rose was given an AMC Pacer when he was awarded the MVP from Sport. Pete doesn’t look to disappointed about the Pacer, and with a salary of $175,000 he could easily afford any car he wanted but is that the car a big shot athlete wants to bee seen driving around in?